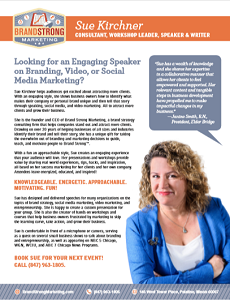 Looking for an Engaging Speaker on Branding, Video, or Social Media Marketing? Sue Kirchner helps audiences get excited about attracting more clients. With an engaging style, she shows business owners how to identify what makes their company or personal brand unique and then tell that story through blogging, speaking and social media marketing. All to attract more clients and grow their business. Her passion for teaching and desire to make the content fun and approachable for her audience creates a unique and engaging experience that your audience will love. 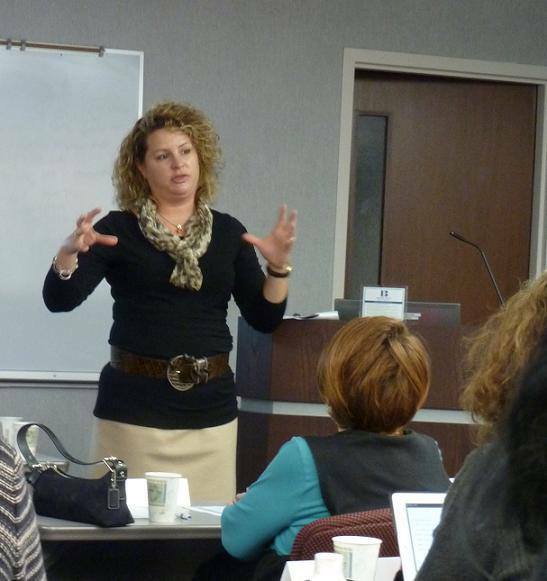 Her presentations and workshop provide value by sharing real world experiences, all based her success marketing for her clients and her own company. Attendees leave energized, educated, and inspired to Brand Strong™! Download Sue’s speaking kit for more information. She has designed and delivered hands-on workshops for many organizations, companies, and universities on the topics of brand strategy, blogging, marketing, social media marketing, entrepreneurship, and international business. She is happy to create a custom presentation for your organization or audience to provide the most value. She is also comfortable in front of a microphone or camera, serving as a guest on several Internet small business shows to talk about entrepreneurship, as well as appearing on NBC 5 Chicago News, WGN, ABC 7 Chicago News, and ABC’s 190 North programs. Want to book Sue for your next event? Call us at 847-963-1805! Here is a sample of Sue’s most popular presentation topics. In order for new customers to hear how your business can solve their problems better, you need to standout and grab their attention. To get noticed and considered, you need to tell people not only the value you deliver, but how that is different from any other alternative solution. In this workshop, the importance of differentiating their brand in today’s crowded, short-attention-span marketplace and find creative tactics to get their message in front of their target audience. By focusing on the right audience, right messaging, and right tactics manufacturers can increase their number of leads, sales and ultimately, profitability. The way that people purchase products and services has changed. Traditional media like TV, radio, and billboards are failing because they can’t capture the attention of the customer. With the Internet, buyers start the sales process without you. They do the research online and have already come to a conclusion before ever talking to you. So what do you need to do differently? You need to stop talking, start listening, and then offer value that helps your potential customer solve their challenges. Social media is a platform to listen, offer value, build trust and then ask for business. You build your brand and trust through connection, caring, and credibility. Social media can be a powerful tool for businesses to get the attention of customers if done correctly. This presentation will outline the seven steps to create a social media strategy that actually generates business. In the 2015 research report on B2B Content Marketing, B2B marketers say they use newsletters, in-person events, and videos most frequently. Of all the tactics they use, they rate in-person events and videos as most effective. In this presentation, we will help companies understand the importance of differentiating their brand in today’s crowded, short-attention-span marketplace and how video has become so important to get a brand message across, especially in digital marketing. Call us at 847-963-1805 to talk about how we can help make your event a success. I just wanted to tell you what a great job you did when you presented to the Women’s Business Initiative members on Social Media. There was a very different level of social media sophistication in the room and you were able to answer everyone’s questions and present the material in a way that was very easy for everyone to understand. As a small, woman business owner yourself, you offered valuable tips and a decision making framework to save time and do more with less, which is important for time starved entrepreneurs. 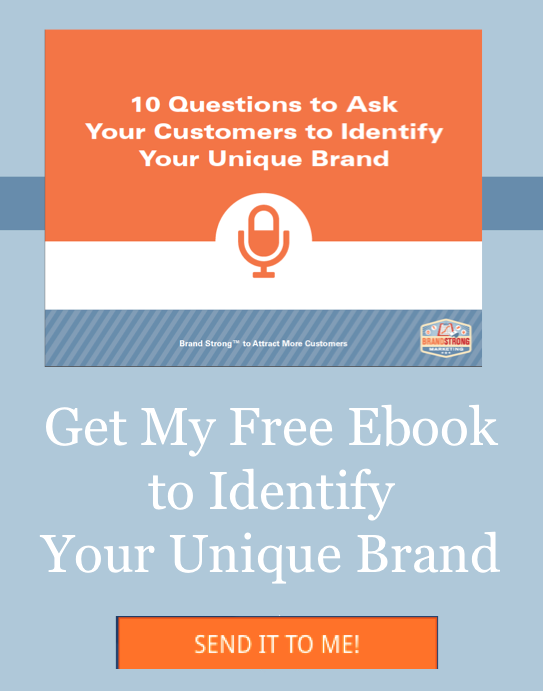 You even addressed the importance of branding and blogging for small business owners to position themselves as experts in their field. “Sue, I want to thank you for presenting How to Market Your Business with Pinterest for our patrons at the Downers Grove Public Library. You were wonderful! Using Pinterest, or any social media, to market a business was a new concept for some of the attendees, and you answered their questions fully and clearly. You are certainly knowledgeable on using Pinterest and how to use it for business opportunities. On my end, you were an ideal presenter to work with. So knowledgeable, organized, and enthusiastic! 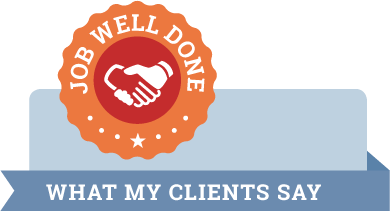 You provided me with your presentation descriptions in a professional, timely manner and you were flexible when we had to add an additional date because the presentation had sold out. You’re the best!